As per Forbes, there are 1645 billionaires in the world as of now, who have collectively amassed fortune worth $6.4 trillion. Compared to last year, 268 new billionaires joined the list, including 42 new woman billionaires. From this list, we present before you 10 billionaires who used technology to make their fortune and changed the world forever. With $77.45 billion net worth, Bill Gates is currently ranked #1 billionaire in the whole world. And everyone knows how Bill earned those billions of dollars: Technology! He brought in world’s most popular operating system and created a company which defied all rules of business. Founder of Oracle has net worth of $49.5 billion, and is ranked #2 tech billionaire in our list. The flamboyant entrepreneur’s biological parents never met him till he was 48 as he was given away to his uncle and aunt for adaption. Amazon’s amazing founder Jeff Bezos has net worth of $30 billion as of now, and he is ranked #3 in this list of technology billionaires. He created world’s biggest ecommerce portal, and redefined ecommerce as we all know it. Larry Page co-founded Google, the biggest Internet Company in the world. With total net worth of $29.6 billion, Larry Page is ranked #4 in this exclusive list of tech billionaires. He is the inventor of the dreaded Page Rank algorithm of Google which ranks websites on its search result pages. Sergey is the second co-founder of Google Inc., and with $29.2 billion, he is ranked #5 in the list of tech billionaires. He is a Russian, whose family immigrated to USA. No wonder USA is often called the Land of Dreams. Having net worth of $26.2 billion as of now, Mark is ranked #6 in this list. Founder of Facebook, world’s biggest social network with 1 billion+ users, Mark is the perfect example of how technology and a dream can literally change the world. Having net worth of $20.2 billion, Steve is ranked #7 in this list of tech billionaires. Steve joined Microsoft in the year 1980 and was Microsoft’s 30th employee. With a net worth of $17.6 billion, Michael Dell, founder of Dell Computers is ranked #8 in this list. He belongs to Jewish family, and his family migrated to the USA. Another example of sheer determination and persistence. Along with Bill Gates, Paul Allen was the cofounder of Microsoft. As of now, Paul is worth $15.9 billion, and is ranked #9 in this tech billionaires list. He is the third Microsoft guy in the list! This explains the importance of team work within an enterprise: no one loses but everyone benefits. She is the widow of iconic technology innovator Steve Jobs and is currently worth $14.2 billion. She manages the Laurene Powell Jobs Trust which also owns 8% of Disney along with 5.5 million shares of Apple. If Steve Jobs would have been alive, then he would have been quite high up in this list. 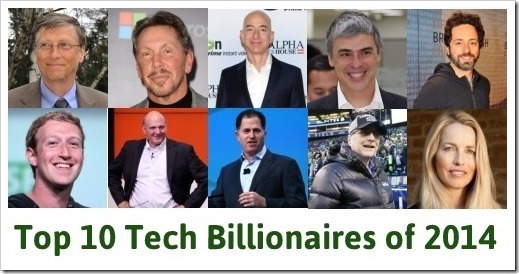 Other tech billionaire who made significant dent in the universe includes: Pierre Omidyar, founder of eBay with net worth of $8.2 billion; Eric Schmidt, executive Chairman of Google with net worth of $8.7 billion; Reid Hoffman, co-founder of LinkedIn with net worth of $3.4 billion. How Indian Smartphone Brands Stack Up Against Global Players! Who really are Social Media Evangelists? tech billionaires and Masterminds. Worth following all of them. Yup.. thanks for your read, Priyanka! Thanks Sachin.. I wrote this keeping in mind that tech startups need motivation and inspiration more than anything else! I think,you missed some names..twitter, whats app..
Hey Rahul.. The error has been rectified! Thanks..